How do Philadelphia Invisalign braces work to straighten and realign teeth? 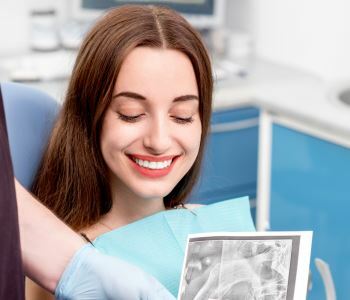 When faced with the idea of straightening teeth and realigning bites, many patients automatically jump to the assumption that traditional orthodontics is the only solution. The images of metal brackets and wires on a patient’s smile can keep them from getting treatment they want and deserve. Everyone deserves a beautiful smile, but not everyone is willing to hide that smile as he or she goes through the orthodontic process. Thanks to Invisalign braces, Philadelphia patients can straighten their smile without metal braces. The Invisalign system is a state-of-the-art alternative to traditional orthodontics. Using clear aligner trays, dentists such as Dr. Spilkia, are able to transform a patient’s smile. When a patient initially visits Dr. Spilkia and has attended an initial consultation to determine candidacy for treatment, impressions will be taken and digitally composed to replicate the patient’s results. These impressions are sent to the Invisalign laboratory where a series of aligner trays are made. These clear trays are made of medical grade plastic. Each one is worn for a period of two weeks before the next one is worn. Through the series of aligner trays, the teeth will slowly readjust into their new positioning and eventually straighten to their final places. Patients are encouraged to wear their aligner trays at all times for fast, effective results. This requires them to be worn throughout the night and during the day when a patient is not eating, drinking, or brushing their teeth. They are easily inserted and removed, and fit snugly in place and are completely comfortable. Compliance is the key to seeing the results expected and achieve the look the patient desires. Nearly everyone is a candidate for treatment. Patients who need to realign their bite can use Invisalign, as well as those who want to straighten one or just a few teeth in their smile. Treatment times vary, depending on the severity of the misalignment, but most cases are completed in approximately one year. The cost and time frame is comparable to traditional orthodontics. Dr. Spilkia and his team are here to help patients improve their smiles. If you are ready to learn more about transforming your smile with Invisalign orthodontics, call David Spilkia Family and Cosmetic Dentistry today to schedule your consultation appointment and get the answers you need to make an educated decision regarding the appearance of your smile!